Forget your old notions that double-hung French doors are passe and inefficient when it comes to weather protections. 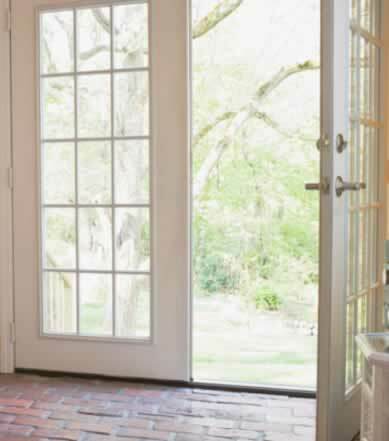 These in-swing colonial-style French doors have expert-crafted hinge stiles, head and bottom rails, and mullions ��� creating a durable, airtight entry that allows unimpeded views of nature's beauty. Modern deadbolt lock systems improve on historical hardware without compromising looks, offering the best protection available. The white French doors complement the floor treatment, illuminating the colors and textures. The snug-fitting sills, jambs, and doorstop provide added insulating qualities against heat, cold, and exterior noise pollution. For added energy efficiency, you can choose optional multi-paned glass lites and e-coated windows that block ultra-violet radiation. It all adds up to a historically accurate, attractive, and resilient set of exterior doors that add value to your home.